I've always been a Colgate girl. It's just always tasted better than other toothpaste brands, and its formula really gets my teeth clean. But then I happened upon the GO SMiLE AM/PM Duo and suddenly my whole outlook on toothpaste changed. I love the concept of this duo, which has separate toothpastes for morning and night that provide such a fun alternative to brushing your chompers with the same paste day in, day out. Each toothpaste is created with the same basic formula. The GO SMiLE fluoride formula -- which prevents decay and keeps your enamel strong -- is accompanied by naturally hydrated silica, which helps to polish away stains. The fun part? Each tube contains a different flavor that corresponds to the time of day! AM has a tangy, citrusy mix of lemon, lime, orange and mandarin oils with a hint of peppermint that really gets your day started off right. It tastes seriously delicious and keeps your mouth fresh for hours. PM is designed to calm you down before bed. A blend of chamomile, valerian root, vanilla and chamomile are deliciously therapeutic. While I'm not sure whether this actually evokes the aromatherapy it promises, I will say I've been sleeping better these last few weeks as a result of using this toothpaste! What's not to love with this duo? Bright, pearly whites will be yours in no time! 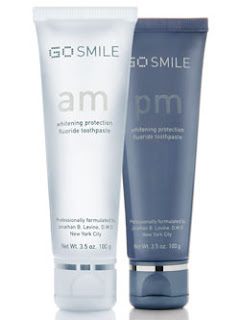 The GO SMiLE AM/PM Duo retails for $30 at beauty.com. whew! and i was crying about a $12.99 whitening toothpaste!